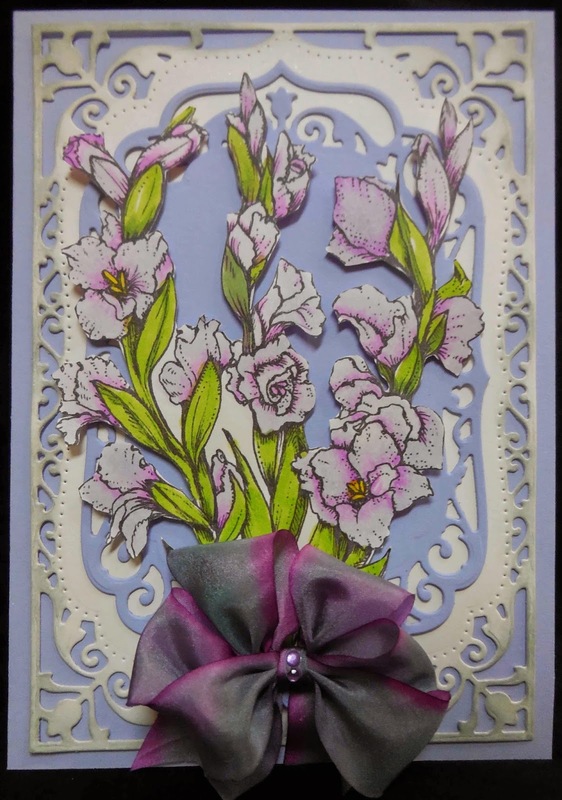 I made this pretty Gladiola card for the challenge over at Power Poppy. I used her gorgeous Gladiola digital stamp and colored them with Copic markers and then fussy cut them out. I used the pretty Spellbinders 5x7 Elegant Labels 4 for the background and edged it in Memento London Fog against the pretty lavender background. I made a triple bow and added some gems to finish the card. Be sure to join in the fun this month at Power Poppy and you may win June's release!!!! Lovely ribbon for these glads Karen! Very feminine and delicate feeling design. Thanks for playing along in our Upbeat Challenge! Beautiful card and fantastic cutting out of the image. Wow Karen -- all that detailed cutting paid off with this creation -- so incredibly beautiful! So soft and pretty!